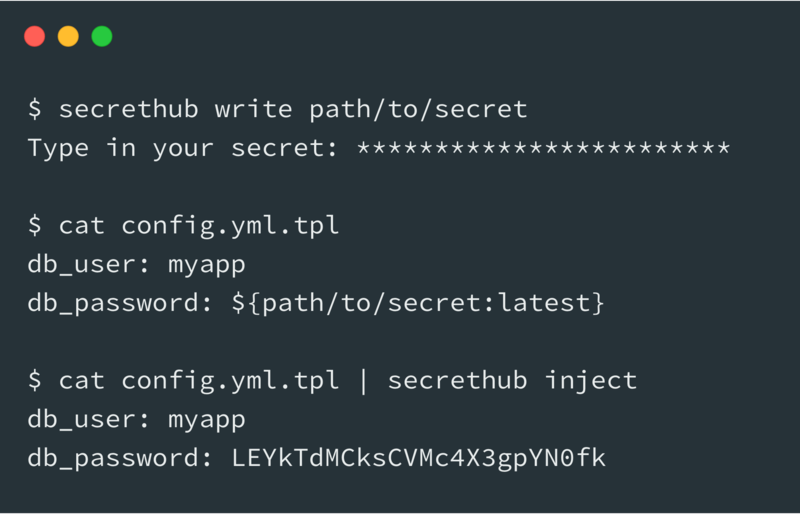 SecretHub helps developers inject passwords and other secrets securely into applications at runtime, removing the limitations and risks of placing them in static configuration code. Take advantage of native integrations to inject secrets into your stack without reinventing the wheel. Use the CLI to write a secret once and automatically inject it into your apps at runtime. Your team never has to see production secrets again. Achieve dev/prod parity by extracting the one thing that must be different per environment: the secrets that secure it. Use template files and native integrations to make your delivery pipelines reproducible. Know and restrict which secrets are used by whom with access controls and audit logs. Stay compliant and ensure you can prove it. All client code is being open sourced and developed in the open. Pull requests are welcome! Your secrets are encrypted client-side so SecretHub never sees your secrets. But don't take our word for it, review the security docs yourself. SecretHub is hosted in 6 datacenters on 2 continents. Enjoy high availability, zero maintenance and multi-cloud straight out of the box. Get started in less than 5 min - no credit card required.